BIRMINGHAM, Ala. (AP) — With rivers still rising after days of storms that dumped more than a foot of rain on the Southeast and damaged hundreds of buildings, authorities searched Monday for two missing people along Alabama waterways as a Mississippi community cleaned up from a killer tornado. Crews looked along the Cahaba River near Birmingham for a woman who disappeared Sunday. A spokesman with Cahaba Valley Fire and Rescue said her vehicle was found near the waterway. In northeast Alabama, emergency workers used a helicopter and drones to look for a teenage boy still missing days after the vehicle he was riding in was swept off a bridge by floodwaters from a creek at Bucks Pocket State Park, authorities said. Two other teens escaped the vehicle. Residents used boats to reach flooded-out neighborhoods and schools were shut down even though the sun was out in most of the Tennessee Valley. Two towns in northeast Alabama imposed curfews because of flooding around Weiss Lake. Mudslides, washouts and floods also have forced officials to close roads in the Tennessee Valley to the north. The weather service reported flooding at nearly 80 locations mostly in Alabama, Georgia, Mississippi and Tennessee. Dozens of roads were closed because of flooding, and conditions will worsen to the south as water drains toward the Gulf of Mexico. 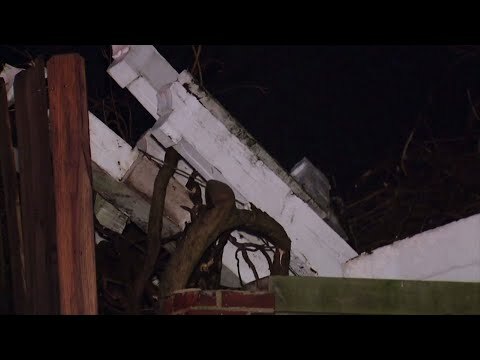 Flooding and tornadoes have damaged more than 500 buildings and 200 roads and bridges over the last week, according to the Mississippi Emergency Management Agency, with damage in nearly half of the state’s 82 counties. Columbus Mayor Robert Smith Sr. said Ashley Glynell Pounds, 41, of Tupelo and her husband were renovating a house Saturday evening, and when the husband went to get them something to eat, the building collapsed in the storm, killing her. In Knox County, Tennessee, officials said a man died after his vehicle became submerged in high water. But flooding in the state wasn’t as bad as initially feared, and Gov. Bill Lee was monitoring the situation rather than planning a visit, spokesman Laine Arnold said. The National Weather Service said many areas got around 10 inches (25 centimeters) of rain last week, and some spots received more than 12 inches (30 centimeters). In Alabama, the riverside city of Decatur said water levels already have exceeded 100-year levels and could rise another 2 feet (0.6 meters). Schools are closed in at least a half-dozen systems in the region. Alabama Gov. Kay Ivey declared a state of emergency allowing the state to assist with disaster response. News outlets report that water rescues were performed over the weekend in some Middle Tennessee counties. Interstate 40 near the Tennessee line with North Carolina was closed by a rockslide, one of the dozens of roads and highways shut down throughout the region, transportation officials said.